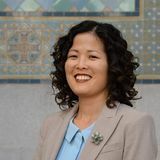 Joanne Kim...manages the Capital Projects team and sets the strategic priorities for business development, housing and transportation projects. She also advises Councilmember Marqueece Harris-Dawson on economic development and planning and land use issues. Before joining the Council District 8 office, Joanne served as the Chief Operating Officer of Community Coalition. There she was responsible for overseeing the management and leadership teams, setting the strategic vision for the organization and building up the human resources infrastructure. Joanne Kim received her Bachelor of Arts in Economics and Master of Public Health from University of California, Los Angeles. In 2009 Joanne Kim was listed as the Chief Operating Officer of the Community Coalition. Help Send Karen To Congress! She's fought for our communities for over three decades, first as an community organizer and activist in South Los Angeles and then as a California Assemblywoman and the first African American woman Speaker of a State Legislature. Help make sure that Asian Americans and Pacific Islanders, other communities of color and working people in California will have a strong progressive voice in Washington. Join AAPI progressives, community organizers, labor activists and friends for a night with Karen. APIs FOR KAREN HOST COMMITTEE: (Organizational affiliation for identification purposes only) Jung Hee Choi (Community Coalition), John Delloro (Asian Pacific American Labor Alliance -- National), Joanne Kim (Community Coalition), Martha Matsuoka, Danny Park (KIWA), Raahi Reddy (SEIU 721). This page was last modified on 3 March 2017, at 01:45.